The first voided morning specimen is preferred for most tests since it is usually the most concentrated, has a more uniform volume and a lower pH. Collect at least 50mL of urine in a Sterile Cup with Transfer Port (Yellow). Secure lid. Peel back protective sticker on the Cup’s lid to expose the transfer port. Insert the stopper of the Yellow/Red Stopper Top Tube into the transfer port. This will pierce the stopper and allow the tube to automatically fill. Allow the tube to fill until urine flow ceases. Remove the tube and gently invert 5 times. Discard the Cup after use. Do not send to laboratory. Note: A smaller amount may be collected but must be manually transferred to a Yellow/Red Stopper Top Tube. 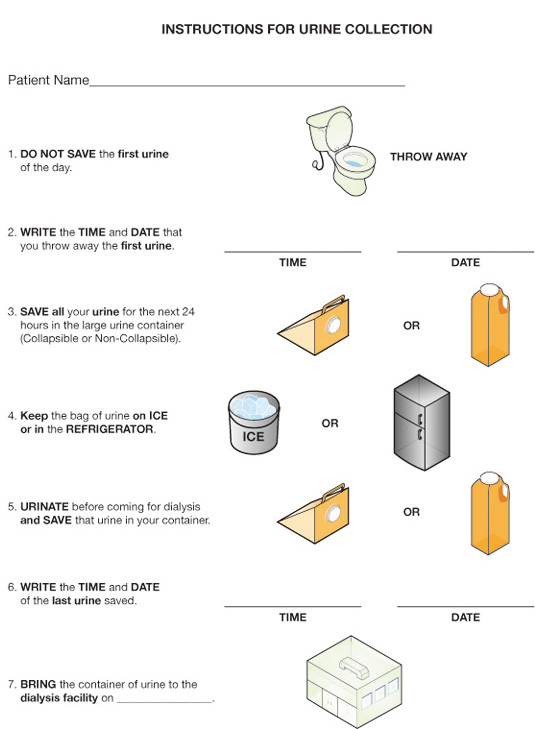 Collect in a large urine container (Collapsible or Non-Collapsible). Label the container with one of the patient’s bar code labels. Weigh urine to the nearest gram (1 g of urine is equal to 1 mL). Record the total urine volume of the 24 hour collection. Prior to aliquoting the urine, gently swirl the container to ensure the contents are well mixed. Remove the lid of the Sterile Cup with Transfer Port (Yellow). Pour an aliquot of the mixed urine into Cup so that it is 3/4 full. Secure lid. Peel back protective sticker on Cup’s lid to expose the transfer port. Insert the stopper of the Black Top Tube into transfer port. This will pierce the stopper and allow the tube to automatically fill. Before discarding the remaining specimen, be sure the collection dates and times and the total specimen volume have been recorded where applicable. Once the container has been discarded, the laboratory is unable to determine the volume of urine. (It is recommended that you record this information at your facility as a back-up, in case the information is required). Note: Since results are based on total volume, it is critical that the volume is measured and recorded accurately. Clearance tests also require an estimate of body surface area. Patient’s height and weight must be recorded whenever a clearance is requested.